Yes, the map is ready for 2018 West Seattle Community Garage Sale Day! Just a quick note for starters – the map IS ready! The printable version, with all 300+ listings, is here; the clickable/zoomable online version is here! One week to sale day – more to say later! Just a short mention for starters. Go to this page on WSB for the online map and a link to download the printable PDF map/listings packet. 9:08 PM MAY 5th: It’s Friday night and tomorrow’s the second-biggest day of West Seattle Community Garage Sale Day season – the day the map goes public! We’re in the final stages of working on it tonight so we’re expecting to have it ready and available around noon Saturday (May 6th) – watch for the announcement here and on our partner site West Seattle Blog, where the main WSCGSD page with the online map, and the downloadable/printable map and listings, will also be linked from our navigation bar/menu when it’s ready. 9:36 AM SATURDAY: Still on track for the maps in the noon vicinity (or shortly thereafter)! PRINTABLE 2016 MAP READY TOO! Been waiting for the printable map? Here it is – a 19-page PDF. 330 sales right now on this year’s WSCGSD map – and you can be among the first to get a look at the map by going here. It’s a 17-page PDF, so consider printing double-sided – get it here. And the online map is headquartered on our parent site West Seattle Blog – see it here. Meantime, please note the added tabs to new pages, all showcasing nonprofit tie-ins for the big day! More updates to come, now that we’re just three days away. It happens every year – a few people have to cancel their sales at the very last minute. We can’t change the “PRINTABLE” version of the list/map – but we are taking them off the online map, and marking the sale numbers as “canceled.” So if you’re shopping, PLEASE check before you head out tomorrow – in addition to marking the canceled sales on the map, we also are listing them on the map’s home page on WSB, and will have a “final” list here. 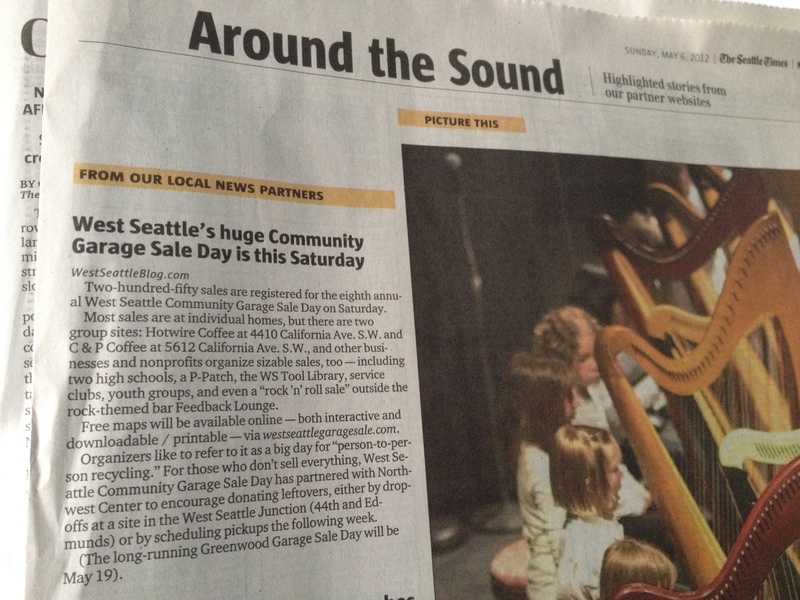 ‘Printable’ list of 2013 West Seattle Community Garage Sale Day’s 280 sales now available! Sorry it took a little longer than we had expected, but we now have the “printable” list of sales, with map slices for reference, available for perusal/download/etc. Here’s the direct link – if you’re printing, consider doing it double-sided if you can, because it’s a 14-page PDF – cover page, 7 pages of sale listings, 6 pages of map sections (had to break it up so there weren’t too many markers overlapping). And again, you can find the online version of the map – clickable, zoomable, and it works well with your smartphone too – by going here. Online version of the 2013 West Seattle Community Garage Sale Day map IS LIVE! *To get the online map in a mobile-friendly version, use this link with your phone’s browser – you can even get the list full-phone-screen and click on individual sales for the address, description, and directions (probably best deployed if you head out next Saturday with a list of which sale numbers you most want to check out!). SUNDAY NIGHT P.S. Our map software provider is working on an issue with the printable appearance of the map, so that version is still some hours away. The sale numbers and descriptions are the same as on the online map – it has ALL the information – only difference is that it is not configured to print well, so that’s why we create a separate, multipage-PDF version as a “packet” of info you can take along if you choose. Thanks for your patience! PRINTABLE MAP: It’s ready! Just finished the 12-page PDF – you can get it here, and it’s also linked from the WSCGSD page on our main site. And best of all, the forecast calls for sun on Saturday. Here’s hoping! The 2012 online map is … online! The printable version will be added when it’s ready – still working on the last few pages – but as promised, the online map is up now that it’s Saturday afternoon. Be sure to scroll down this page on our partner site West Seattle Blog, beneath the map itself, to read tips on how to use it – you can print individual listings (or at least more easily cut-paste text if you’re making your own list), get directions, and more. Just go here! One week to go, till West Seattle Community Garage Sale Day 2012! Now that it’s Saturday … we are one week away from the 8th annual West Seattle Community Garage Sale Day – 9 am-3 pm next Saturday, May 12th! As promised, the maps showing all 245+ sales – clickable online version and printable/downloadable PDF version – will be available today, and as usual, it’s down to the wire for us completing them, doublechecking them, etc. Just wanted to get a mention here in case you are a seller or shopper eagerly anticipating next Saturday – a few sellers have stumbled into PREVIOUS YEARS’ maps out there in the archives and mistakenly thought they had been left off the map – no, the 2012 maps are NOT online as of this early-early-am writing. We’ll announce it in our 5 official channels (here, West Seattle Blog, the WSCGSD Facebook page, the WSB Facebook page, and the WSB Twitter feed) when they are. Thank you! The online map is the most thorough, easily explorable version, but we know you’d like to have something to carry out when you head out on sale day. Here it is. There’s a silver lining in every cloud. The map service we turned to, after Google Maps scrambled the 1st version of this year’s map, has many more features for viewing and displaying. So for starters, we’ve given it its own page on WSB. If you would like to see the map fullscreen on Zeemaps, the link is here (be sure to choose VIEW then LIST, or click double arrows at upper right, so you get the list of numbered sales on the right side, and numbers on the markers). 5 pm Saturday – we are still working – the 260-sale list blew up the Google version we had spent the past week working on (Google is how we made the last three years’ maps, no problem) so we’ve moved everything over to a more stable mapping system. Our apologies for the delay – since we’ve done everything the same way the last three years with great success and smooth sailing, there was no reason to believe a road bump would emerge, but it did. The online version will still be available first and we’ll post that link as soon as we have checked and doublechecked to make sure everyone’s there; then we use the online version as a base for the printable version. We can’t stress enough, though – IF YOU THINK YOU HAVE FOUND THE MAP ONLINE SOMEWHERE, YOU HAVE NOT. You have found either a previous year’s map, or maybe despite our best efforts to keep it “unpublished,” some part of this year’s work in progress. P.S. Shoppers and sellers are talking on the West Seattle Community Garage Sale Facebook page – if you want to mention something special about YOUR sale, or if you want to post that you are looking for something in particular, in hopes of finding who has it – you are welcome to post on the wall! The page’s direct address is facebook.com/westseattlegaragesaleday. From 200 sales last year to 260+ this year is quite a leap, especially for the mapping system, so we are chugging as fast as we can. We will have the online map available by tomorrow (Saturday) as promised – the printable map as soon as possible after that – and once that’s ready, we will be printing a limited number of copies to make available at a few locations we’ll announce then. Bottom line: The SECOND the online version is available, we’ll announce it here, on West Seattle Blog, and on FB. If you are a seller, we will be sending your info – including how to donate leftovers to Northwest Center or WestSide Baby if you are interested – as soon as we finish the map. Meantime, be sure to “like” the WSCGSD page on Facebook, where you can read other sellers’ updates, post your own, and we’ve also invited folks looking for specific items to post there, in case some connections can be made pre-sale. Thanks! The Google Map is correct and updated. The printable map is not, so if you are using that, please make these changes. Thanks! We now have three changes to The Map. One of the first sales to register did not make it onto the map – our apologies, and PLEASE note this sale – it is now on the updated Google Map (which you can see here), with a big blue marker! It’s at 3250 62nd SW.
Also, two sales have now canceled because of last-minute emergencies: #105 and #149. Again, the Google Map is updated, but the printable map cannot be updated, so please manually scratch them out (and add 3250 62nd SW – its ad is also in the Google Map when you click the aforementioned blue marker). Thanks – just two days to go! Forecast still looks good – National Weather Service says “partly sunny” for Saturday. 2:25 PM UPDATE: We’ve had a third cancellation – sale #95. It’s also now off the Google Map, but be sure to scratch it off your printed map if you’ve already printed one. If you have already printed out a map – please scratch off sale #105 (4711 SW Findlay) – while last Thursday was the deadline to cancel sales and get them off the map ahead of time, we can take sales off the Google Map, and make note of cancellations here if need be. 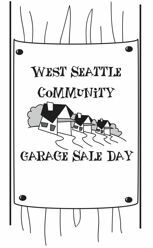 Just four days till the 6th annual – and biggest ever – West Seattle Community Garage Sale Day: 200 sales (with hundreds more sellers, thanks to group sale sites, organization/school/business/block sales, etc.)! What you see above is the Google Map we made available on Saturday night; today, we also have the “printable” map, completely different format, including the map sliced into sections, and all 200 sales listed in numerical order (which is roughly #1 in the north to #200 in the south). Here’s the 12-page Word doc (6 pages if you print both sides). (added) Also, a PDF version if you’d rather print it that way. Keep checking here before sale day in case there are any updates. We are still finalizing the printable map – but first we want to publish the link to the Google Map, particularly so that if you are a registered seller and you don’t see your sale on there, you can let us know in time to fix it. We are not distributing a lot of preprinted hard copies this year – just a few hundred for those who absolutely don’t have printers – so that means any omission is more fixable than ever. We have checked and doublechecked and done our best, but if you don’t see yourself, please e-mail garagesale@westseattleblog.com ASAP and we’ll check into it. Meantime, here’s the Google Map online version – the printable version will be a different format, with the peninsula map “cut” into several pieces, and the listings grouped together 1-200. **Two sale participants have e-mailed to say they saw the map and wanted to know why they’re on it. If you think you’ve seen a Garage Sale Day map, please take a closer look, because it’s NOT the 2010 map. The 2008-2009 maps may be out there somewhere via Google, and certainly in the archives here, but they are clearly labeled by year. This year’s map will be posted here by Saturday night, and will be clearly announced as this year’s map. **We are stuffing envelopes for sale packets today. They contain your “official participant” 8 1/2 x 11 signcard (in a festive light green this year, a welcome letter, and information on donating “leftovers” via Northwest Center if you are interested. If you don’t receive yours by Wednesday, call 206-293-6302 and we’ll get you one – last couple years we wound up running one or two over to folks whose packet got lost in the mail, but the overall success rate has been pretty good. Online, printable and Google Map formats, by 9 pm Saturday. Limited run of hard copies – please only pick one up if you do not have access to a printer – by Monday. Caveat – this is the Google Map *online only, does-not-print-well* version. We gave out 200 copies of the printed version at today’s Sustainable West Seattle Festival, but are trying to tweak the map display a little before (a) printing more copies for distribution to local pickup spots tomorrow and (b) linking the PDF for you to download and print your own copy. That said, in case you have some time to spare tonight, we are offering you THIS version of the map in case you want an early look at whether there are sales near your house, sales with any particular items you’re looking for, etc. PLEASE – honor the fact that these sales are 9 am-3 pm next Saturday, and don’t contact anyone sooner – we made the map earlier this year (the previous four years, it was available just for a couple days ahead of the sale day) mostly just in hopes earlier availability would help shoppers plan better. Also note: While the sales are numbered, the list in the left margin of the map is NOT in order (the numbering was done north to south after entering all the addresses) – to navigate the map, use the scale on the left side of the window to zoom in and out, and when you see a sale number you want a closer look at, click the place marker (this is best done when zoomed in VERY closely, as the place markers have invisible edges beyond the circles) and it will open a “balloon” with the exact address and the short sale description. OR – look at the list in the left margin and when you see a sale you want to find, click the address line, and you will be taken to that spot on the map. Again, here’s the link to the Google Map online-only version. We will let you know tomorrow when we have the printable version ready – the sales have the same numbers, but otherwise the layout is very different, designed for use as a physical document. Shoppers: Please do not contact sellers before 9 am Saturday. Thank you! This is the same version we have printed and distributed to pickup locations (listed on this page). If you have access to a printer, please print your own copy here, so there are enough preprinted maps for people without computer/printer access. If you are a seller, consider printing a few extras to have on hand for shoppers who turn up Saturday and don’t realize it’s WSCGSD. This one doesn’t print out so well, but it can’t be beat for online viewing, clicking on sale sites, zooming in on certain neighborhoods much more closely than we could do with the printed version, maybe even calculating directions to your favorites. You can navigate it two ways: Click on a spot on the map to bring up a “balloon” with its exact address and the “ad.” Or, using the list of addresses on the side of the page, click on an address and it will take you to that spot on the map. We are adding all this information to the “How to Get the Garage Sale Day Map” page on this site, as well (click to it any time from the navigation bar beneath the page header). If you have any questions or problems related to anything about West Seattle Community Garage Sale Day, please call us at 206/293-6302, or e-mail us at garagesale@westseattleblog.com — Once it’s all said and done, we will be soliciting feedback for how to make next year even better, too; this is our first year organizing it, so definitely a learning process, even with the great basic template Megawatt previously had going. Last mention – remember the contests – “Most Unusual Item” (shoppers and sellers can enter; send a photo after the sale ends 3 pm Saturday, tell us where you bought or sold it) gets the $40 Hotwire Coffee card, “Best Sign” gets the Illusions Hair Design certificate (sitting here in a beautifully ribboned gift box already) – send us a photo of your sign. We’ll announce the winners Monday night.